Muslim tombs on the right of the road leading to the tomb used as a mess house, Khuldabad (Rauza). bl.uk > Online Gallery Home	> Online exhibitions	> Asia, Pacific and Africa Collections	> Muslim tombs on the right of the road leading to the tomb used as a mess house, Khuldabad (Rauza). 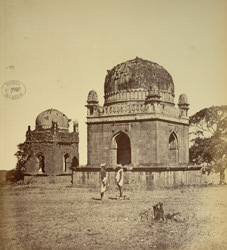 General view of two domed tombs at Rauza in Maharashtra photographed by Henry Mack Nepean in 1868, from the Archaeological Survey of India Collections. Rauza, or Khuldabad, meaning ‘Heavenly Abode’ is an old walled town renowned for its onion-domed tombs. The town is of religious significance to Muslims as the Emperor Aurangzeb (r.1658-1707) is interred here, together with his second son Azam Shah, Asaf Jah, founder of the dynasty of the same name, other royal figures and several Muslim saints.